All over the world there are children sleeping in streets, doorways and under cardboard boxes, surviving by eating leftover food, doing heavy manual labor, selling trinkets, begging and stealing. Children are the future of their country, and of the world. 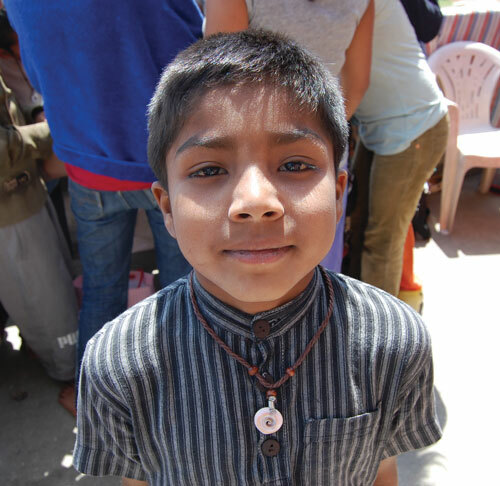 Our assistance benefits organizations in Nepal, and Peru. Donations can be made to Holy Ground Farm, which is a non-profit tax deductible 501(c)3 organization. Your help can make a difference is so many children’s lives. Click the "Donate" link below. Holy Ground Farm provides for shelter, food and schooling. 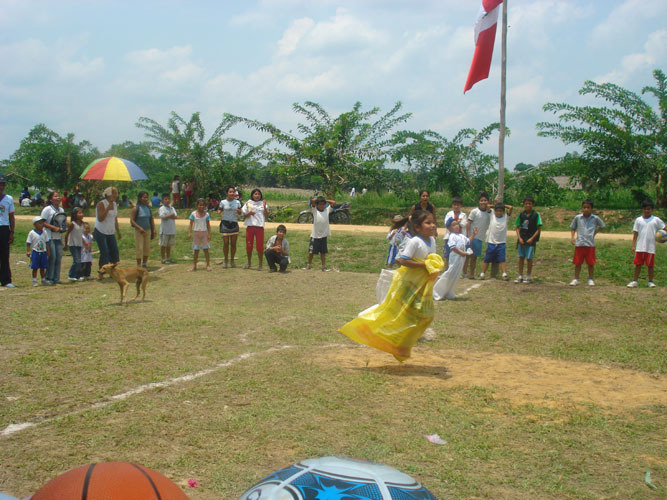 In addition financing is provided for teachers for five remote village schools plus food for children at school. 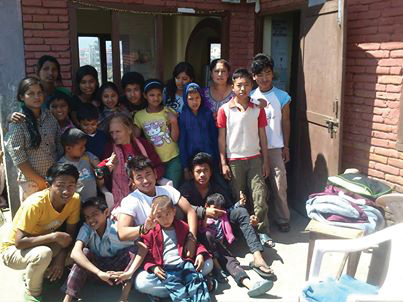 This is Cathy with the children in front of the Happiness Orphanage. The children are in their school uniforms. All are doing well in school. Cathy and helpers with some of the children. Some of the children and a helper having lunch at the orphanage. Art class at the Happiness Orphanage in Nepal. Some land has been rented where the children have created a garden. They really enjoy working in the garden. They are very proud of their accomplishments. Testing out a brand new water filter. Cathy with Shasanta Baba's wife. Children at the orphanage dancing. More dancing and just having fun. Baba's office with some of the work that he does. Community church building with open class rooms under building. 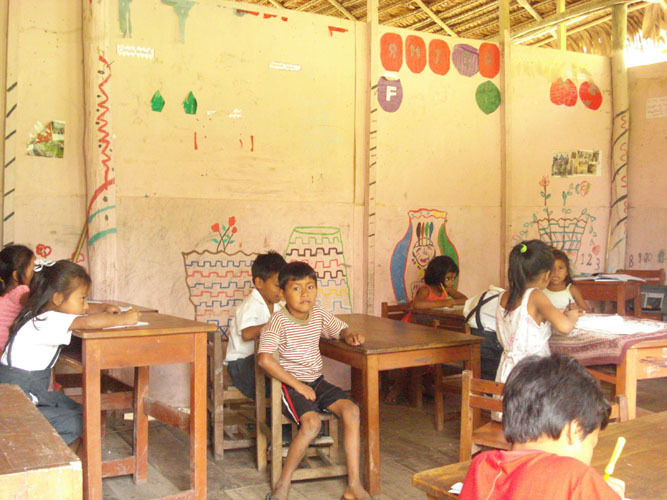 Typical rural class room with thatched roof and open walls. 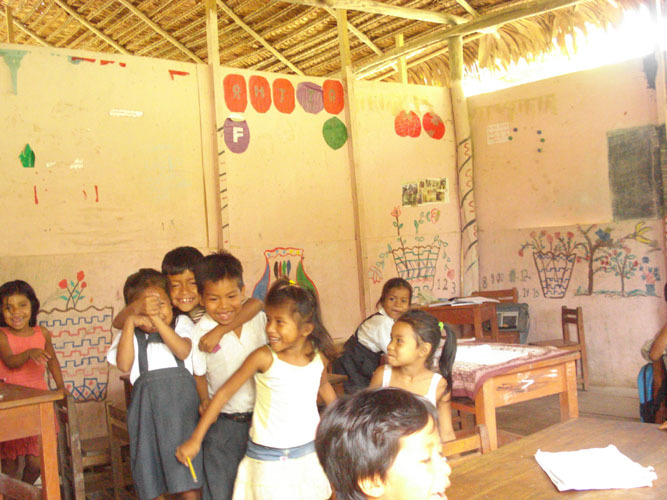 The River School (public) is located on the other side of the main river that flows through Iquitos and then a half hour walk through the hot jungle. 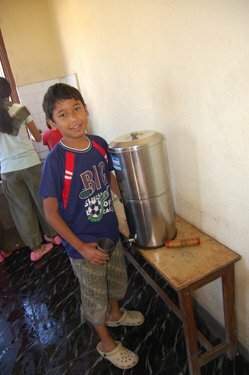 The community that the school serves has neither electricity or drinking water. All consumable supplies (i.e. water, food, etc.) have to be brought here from Iquitos. 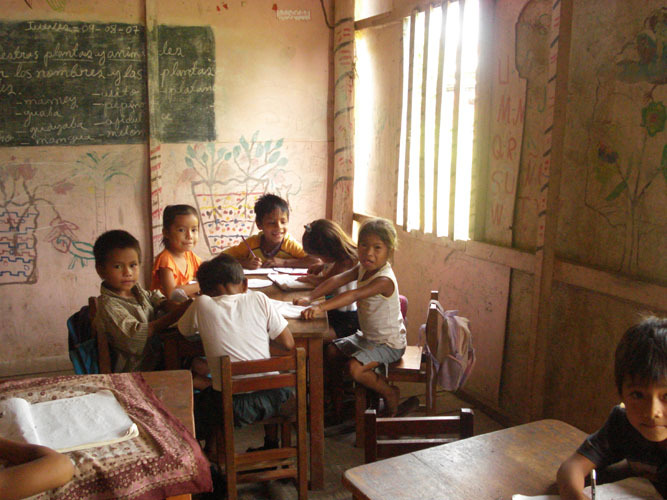 All public schools in Peru are run by the Peruvian government. 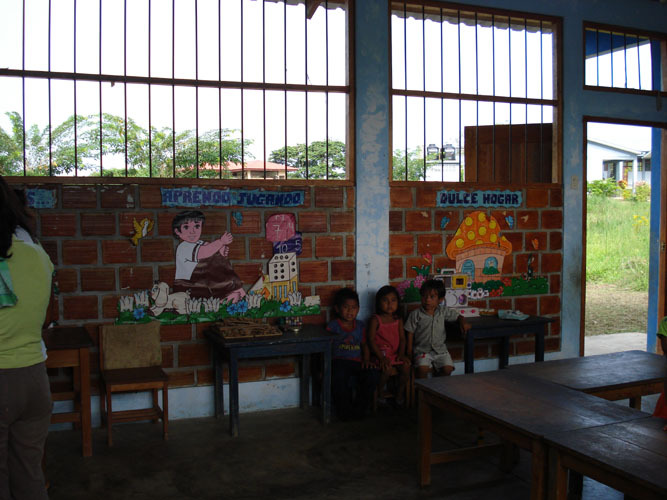 One of several rural kindergarten class rooms. Dean Logan (on right) with Besty Dávila Macedo, teacher (in center) and father of little toddler. Open house in one of the elementary class rooms. 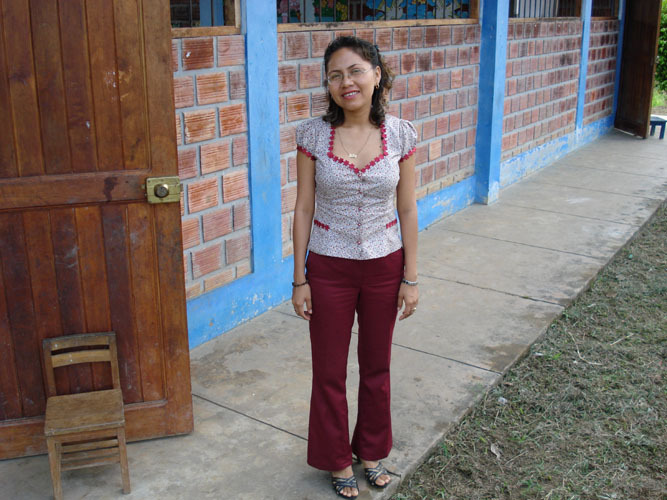 Besty Dávila Macedo, elementary school teacher. Elementary class room open house with Dean Logan (seated) and Besty Dávila Macedo, teacher. Parent and children at elementary class room open house. Some of the children gathered around Dean Logan for photo session. Typical rural out-house bathroom facilities. Girls on Left, Boys on right. 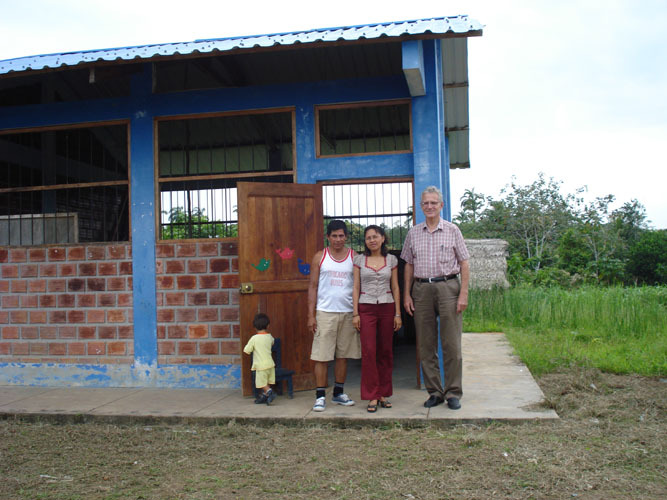 Dean Logan with Besty Dávila Macedo, elementary school teacher, in front of class room building. Dean Logan (LNDI) presenting emergency lighting equipment to Km 65 community. 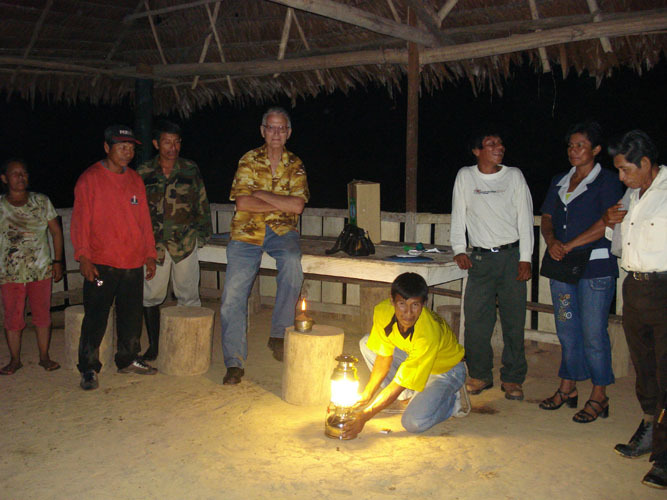 Community villagers gather around kerosene lamp presented by LNDI. Community leaders preparing for weekly Sunday morning meeting. Community villagers gather for Sunday morning meeting. Community residences participating in Sunday morning meeting. Notice little girl smiling in back of post. Several years ago Leon Jones went on a trip to Peru with some friends. He quickly fell in love with the people and soon returned to Peru. Using his own resources he started a center for children. Winning the respect of the local community, he managed to make an enormous difference, particularly for the children. Detailed Map of the country of Peru. Notice the city of Iquitos in the upper-middle part of the map. Iquitos is at the mouth of the Amazon River. It is here that many travelers go to book excursions into the jungle. It has a population of over 400,000 people. In the poorer section he ran a day care center for 25 children between the ages of 3 and 5 years old with the help of a retired teacher. The children got two meals a day. This made it possible for their mothers to go out and earn a meager living. Leon organized a volley ball team each year for the older Indian children to help them develop self-esteem. The uniforms were paid for out of Leon's personal funds. People live in open air houses on stilts (because of flooding problems from the Amazon River) or under tarps. Many have only a dirt floor and one room. Extended families may all share one house. 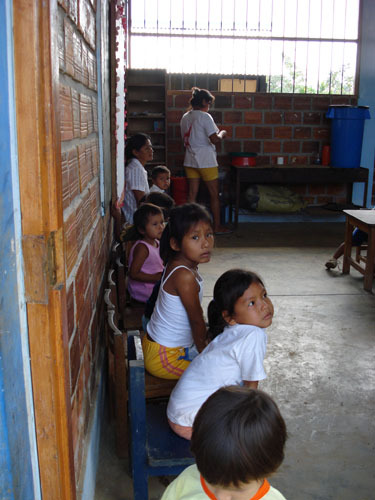 Unemployment in Iquitos is as high as 50% making supporting a family next to impossible. Many families are unable to support their children. These children are forced to live on the streets, supporting themselves anyway they can. Donations for helping to support programs for the children may be may be made payable to Holy Ground Farm and are fully tax deductible. All of the money donated will go to assist the children. Leon with a Peruvian Family in front of their home in Iquotos, Peru. Indian Children Volley Ball Team. Typical Homes that the indigenous people of Iquitos live in. 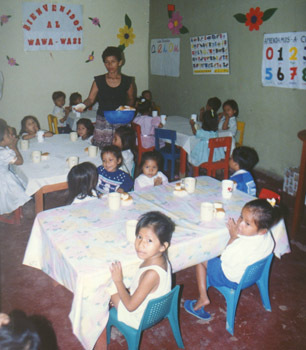 Leon's WaWa-WaSi Day Care Center in Iquitos, Peru. 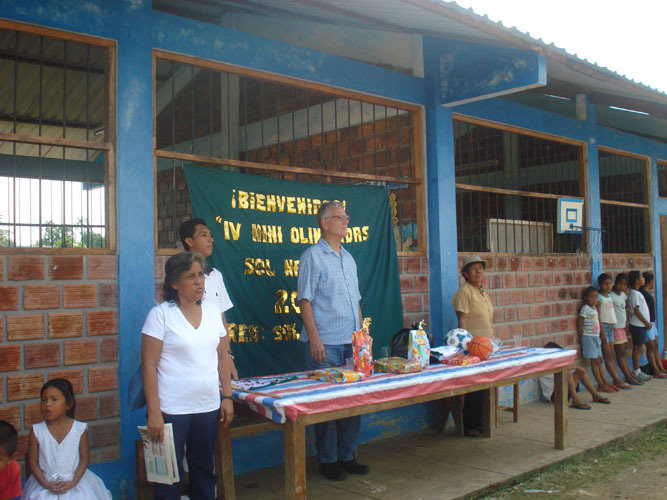 Leon Jones standing in front of Los Niños de Leo in Iquitos, Peru. Thank you for your generosity. Our ministry is supported solely by donations. You can give hope to people who otherwise would have none and a smile on the faces of children living in poverty.